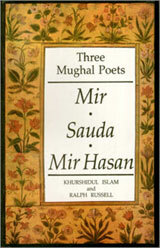 This book presents to English speakers the poetry of three great 18th century South Asian poets of Urdu: Mir, a love poet, Sauda, a satirist, and Mir Hasan, a writer of romantic narratives. An introductory chapter explains the background of the society in which these poets lived in Delhi, the Mughal capital of a fast declining empire, and explains also the poetical conventions within which they worked. This was the first book I wrote in collaboration with Khurshidul Islam. (For a description of our collaboration see part 2 of my autobiography, Losses Gains.) For the section on Mir the verses selected were arranged in such a way as to portray the standard, generally tragic, course of the illicit love which was the only kind possible in 18th century Indian Muslim society.